Manny Pacquiao of the Philippines, the best fighter in the world, will defend his World Boxing Organization welterweight title on Saturday, May 7, against Sugar Shane Mosley of the United States. The fight will take place at the MGM Grand Garden in Las Vegas, Nevada. Pacquiao is overwhelmingly favored to win this fight, coming in as high as an 8-1 favorite in most betting venues. 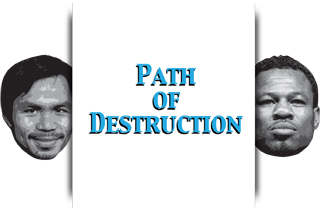 Not only has Mosley been less than impressive in his last two fights; Pacquiao has been a beast in the ring for seven years running now, leaving a path of destruction in his wake. Pacquiao has been dismantling physically bigger and stronger opponents in his last few outings — Oscar de la Hoya, Ricky Hatton, Miguel Cotto, Joshua Clottey and Antonio Margarito. FIGHT RESULT: Pacquiao beat Mosley by unanimous decision, knocking the American down in the third round with a crushing right-left combination. From then on, Mosley was on survival mode — running, covering up and refusing to engage — practically turning what was expected to be an all-out war into a non-competitive, one-sided beatdown. The last man to beat Pacquiao was Morales, who won by unanimous decision in their first encounter in 2005. They fought twice more in 2006, both won by the Filipino phenom in convincing fashion — the second fight by a 10th round technical knockout, and the third one by a devastating stoppage in the third round. This interactive graphic looks at Pacquiao’s ring conquests in the last seven years, a remarkable body of work that has earned him professional boxing’s richest prize and highest honor.